This window is shown whenever a report or chart is selected from the Reports menu. To open the report window, select a report from the Reports item in the Menubar. This will open a new window with the report displayed. It provides a web browser type display with active links to account data. Depending on the report there may be a delay while the report is generated. An approximation of the progress to completion is displayed in the Statusbar, if has not been opted out of displaying. 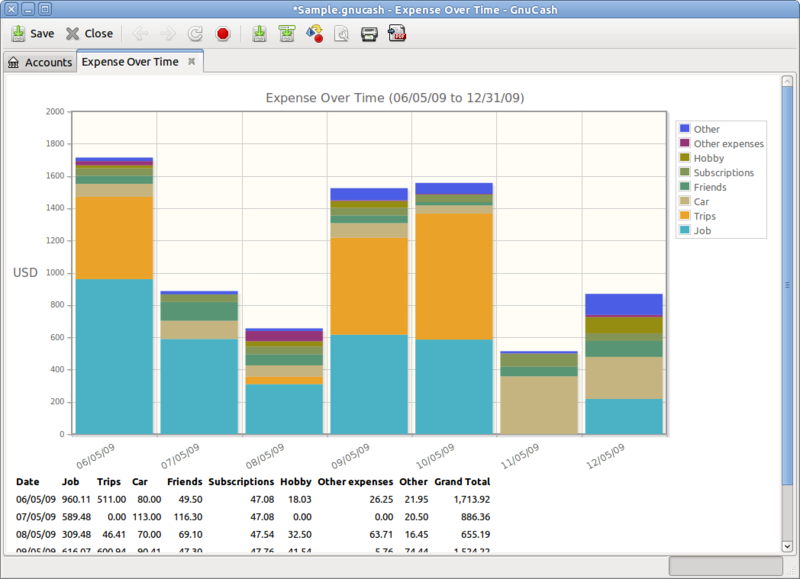 This is an image of the Income/Expense Chart. The Menubar for the report window contains the following options. Clicking on the File option of the Menubar will “pull down” a menu of options described in Table 4.17, “Report - File Menu - Access to file and account operations and printing.”. Table 4.17. Report - File Menu - Access to file and account operations and printing. Let you choose the paper size, layout and margins for printing. Exports the displayed report as a PDF file. Export the current report in an HTML formatted file. Table 4.18. Reports - Edit Menu - Access to file and account editing operations and preferences. Open form to edit/modify report selection criteria, stylesheets, date ranges, and many other parameters. Set tax characteristics on account(s) (US). Assign tax form and line to account. See Section 10.5, “Setting Tax Report Options”. Table 4.19. Reports - Actions Menu - Setup scheduled transactions. GnuCash gives warnings when certain operations are attempted, such as removing a transaction or removing the splits of a transaction. The warning message gives you the option to not give you these warnings when attempting the operation. Check-boxes labeled Remember and don’t ask me again and Remember and don’t ask me again this session allow disabling the warnings. This option resets the warnings to the default, This option resets the warnings to the default, i.e. display all warnings. Lets you type a new name for the current page or tab. The items shown in the Business menu are the same as listed in Table 4.5, “Account Tree - Business Menu - Access small business features of GnuCash.”. Table 4.20. Report - Reports Menu. Save the current report configuration. If you are not working with a saved report configuration, you will be asked to give it a name. You will be able to run the exact same report again by using the Reports → Saved Report Configurations menu item. Save the current report configuration with a new name. The items shown in the Tools menu are the same as listed in Table 4.7, “Account Tree - Tools Menu - Access to miscellaneous tools and editors”. The items shown in the Windows menu are the same as listed in Table 4.8, “Account Tree - Windows Menu”. The items shown in the Help menu are the same as listed in Table 4.9, “Account Tree - Help Menu - Access to this help and the Tutorial and Concepts Guide.”. The Report Window has a Toolbar to quickly access the functions used with reports. The Toolbar can be hidden or shown by selecting View → Toolbar. Move back one step in the history. Move forward one step in the history. Saves the displayed report. You will be able to run the exact same report again by using the Reports → Saved Report Configurations menu item. Saves the displayed report in a configuration file with a given name. You will then be able to run the exact same report again by using the Reports → Saved Report Configurations menu item. Exports HTML formatted report to a file. Edit options specific to selected report. Queues the current report for printing. Exports the selected report as a PDF file. The Tab bar displays “notebook/file folder”-style tabs for open transaction registers, account trees and reports. This is where the report or chart you have selected is shown. The properties of this window are editable in two ways. Selecting the Options button on the Toolbar lets you edit what the report is showing and which accounts the information is drawn from. Selecting Edit → Style Sheets... lets you select the properties of the page that displays your report. The report is able to act like a web browser if your report contains links to external web pages. The Toolbar buttons allow you to move Back and Forward through web pages. It will also open account registers when you click on links to accounts contained in the report. You can also Export your report to a file and Print the report through the Toolbar buttons. The Summarybar is not displayed when viewing a report window. The Statusbar works the same as described in Section 4.2.6, “Statusbar”.